Anyone else SO excited that Christmas season is officially upon us?! I can’t believe December is on Thursday (psst there’s a really exciting post to kickoff December headed your way Thursday. Hint: it features a surprise guest whose never been on the blog before!). I’m definitely the person who puts up all of their Christmas decorations the Friday after Thanksgiving. While I’m always sad to say goodbye to fall, I love how cozy the apartment feels with all the decorations up! You can check out my holiday decor gift guide here. Today’s look is perfect for those days where you want to feel festive, but don’t want to look over the top. After all, we do still have almost a month to go until it’s actually Christmas. UGH. I love this plaid shirt and sweater combo because the colors are festive, but not overdone. The deep burgundy red sweater doesn’t scream Santa Claus, and the tartan shirt would be just as cute in the fall as it is for the holidays. I paired it here with this fun suede mini skirt for a dressier look, but how pretty would this outfit look with these emerald green corduroys? Perfect for a laid back holiday brunch. Has anyone else put up their holiday decorations yet? Every year I add a few more things to my collection, I just ordered this red truck and camper ornament set from Target. I’m a sucker for any Christmas decor with cute little red trucks and trees on top (I also have this door mat, and a living room pillow to match. It’s a problem). What’s your favorite holiday decoration?? Don’t forget to check out my holiday decor guide for all my favorite items from this season! These colors look amazing on you, girl! Can’t get over it…this look is so YOU. Love this color on you! The skirt is so cute too! I love this color combo on you! 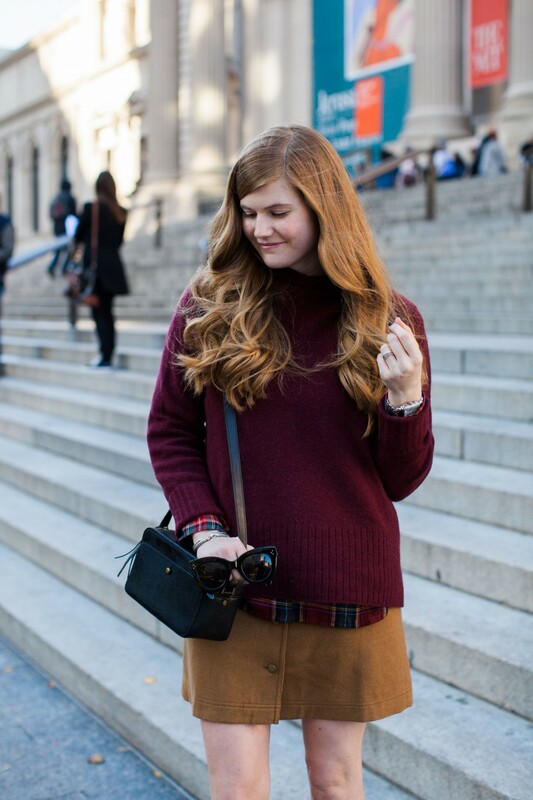 Also, love how you layered the plaid under your turtleneck. Your outfit is adorable! It’s perfect for Fall/Winter and I love the plaid layered under your sweater!! You always have the most sophisticated outfits .. I love it! The dream location!! I’m loving your outfit – so perf! The skirt with the knit and the heels are totally on point! Love this cute outfit! One of my favorite places is The Met, it’s such a beautiful building with so many great things to see. This color palette is so beautiful and your hair looks amazing! This is so pretty! The plaid is perfect! Love your color palette for this look – perfect for fall! Super cute! 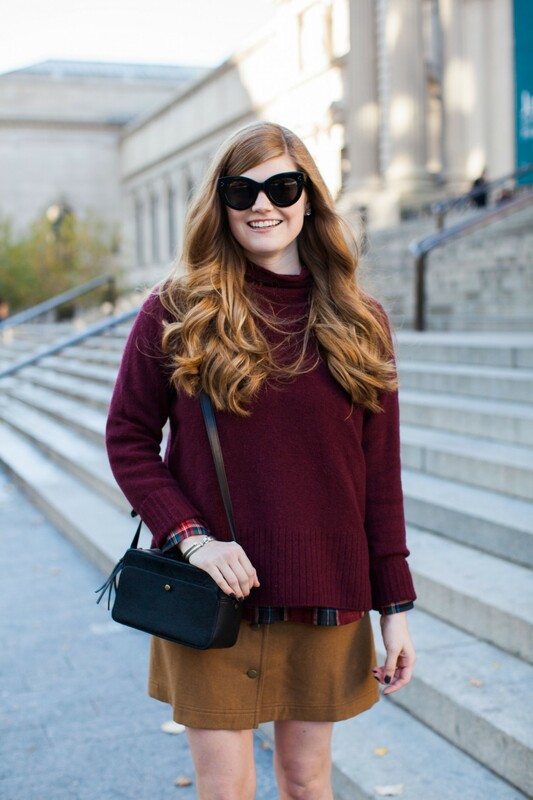 I love the burgundy and plaid paired together. LOVE this skirt!! You have such great style!! This outfit is one of my faves! The layering and colors are perfect! 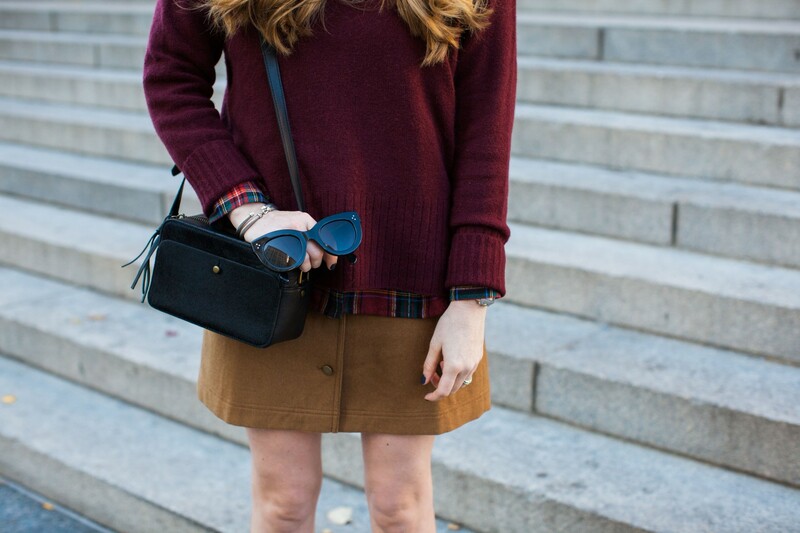 I’m loving that suede mini on you, so cute! I love this chunky sweater! So cute paired with the skirt! This is a gorgeous color combo on you! I love the skirt! Bordeaux is your color, love this look! Love this color combo on you!